We really like to play around with different room plans before we actually do a renovation. We tend to go back and forth and tweek a lot before we settle on a final plan. At this point we usually do a 3D plan to get a really good feel of what the room will look like and then tweek a little more. Here is the final 3D plan of our first kitchen and the end result. 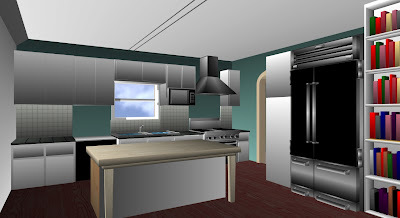 We really liked how we were able to visualize what the kitchen was going to look like without having to do the work. Now that we are thinking about renovating our new kitchen, we are starting the process of virtually rearranging the room. Here is the current layout of the kitchen. I'm using a program called Floorplanner that I found online (for free). It's a good basic program for when you are just want an idea of how things will fit together. The half bath that we currently have wastes a lot of space because it has the space in front of the back door and the long hallway to get to it. The closet under the stairs that we are currently using as a pantry/catch all room is plenty big to house a half bath so we are very sure that we are going to move the bathroom into that closet (so you will see this in both designs below). It won't be hard to do since it shares a wall with the current bath so it will just be turning the plumbing around. Once we move the bathroom, we can take the wall down in the kitchen and gain A LOT of sq footage in there. Once we get to this step, we are still up in the air on what we want to do. Below are two designs that we are thinking about. In both I have a washer and dryer in the kitchen, but after talking a lot, we don't think we're going to try to fit them in. We really want to keep the original cabinets since it is an historic home and they are really well built. Because of this, you'll notice that the bottom left corner of the kitchen doesn't change so the design question come into the rest. I've come to really like islands in a kitchen (hence design 2) because I find them really functional. That being said, in the current setup, the kitchen is too small to have 2 people comfortable cook without bumping into one another. To open it up even more, we want to take the wall down between the dining room and the kitchen. We're not sure if a peninsula would be long enough in the space to be functional and we're also not sure if taking these walls down will open the kitchen up enough for an island to become practical. I think we're going to have to do some more designs, probably tape out the design on the floor, and even possible wait until walls come down and the bathroom gets moved to make a final decision. The one great thing about this renovation vs our last one is that we will have a functional kitchen for the entire renovation and have a bathroom to use as well. This will cut down on the trips to restaurants for both food and the bathroom! So what do you think? Design 1, 2 or a completely different idea? We're open to suggestions!